In barbecue season the butcher's case is bulging with baby back ribs, spareribs, country ribs, rib tips, St. Louis cut ribs, riblets, rib chops, rib roasts, baby spareribs, button ribs, Danish ribs, loin ribs, and, across the street, there are McRibs. The prices range from $2 to $8 a pound. Here's what you need about the most popular cuts before you fire up the grill this Labor Day. 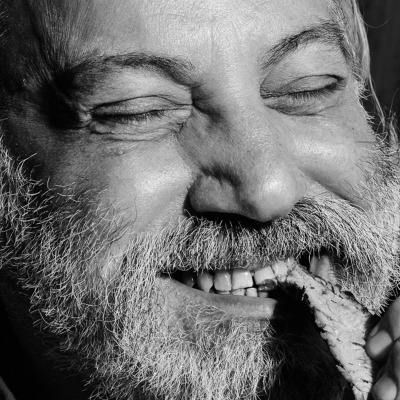 Click here to read more about the other cuts of ribs and how they are butchered (and learn what McRibs are), how barbecue champions cook "Last Meal" ribs, and how the most popular ribjoint in the world, Rendezvous in Memphis, cook its ribs. No, they do not come from baby pigs. They are called babies because they are shorter than spareribs. 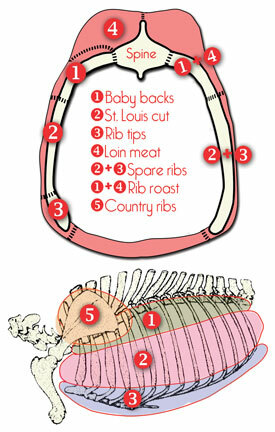 Connected to the backbone, nestled beneath the loin muscle, baby backs are the most lean and tender ribs. A typical slab has 11 to 13 bones, tapered at one end, with the shortest bones only about 3" and the longest about 6". The bones are usually curved like a hockey stick at the end where they meet the spine. Depending on how the butcher removes the loin meat that is on the humped side of the bones, some can have up to 1/2" of delicate, lean loin meat on the top. Usually about 1.5 to 2 pounds per slab, about half of which is bone, many hungry adults can eat a whole slab of baby backs. Typically $4 to $8 per pound, baby backs are more tender and less fatty than spareribs. They are also commonly called back ribs, loin back ribs, loin ribs, and Canadian back ribs. They are leaner than spareribs and incredibly good when smoke roasted low and slow at about 225F for about four hours and slathered with barbecue sauce just before they are removed from the grill. Low temp cooking makes the copious connective tissues and muscles soft and juicy. High temps make them tough.